Sleepless and satisfied I have returned to the US of A. 4am wakefulness allows for thoughtful recollection of my recent journey and passage back to NYC. 2 days ago we boarded a bus in Sri Lanka at 2am- we were lucky enough to get seats- many people had to stand the whole five hour journey. I was quite surprised that the bus service in Sri Lanka is 24 hours and highly utilized by the locals. Driving there is insane- but we had become accustom to that. The only seat left actually was the front seat lolol with the direct view of the road. I slept away in my lil zen place I go when I no longer have control and know the view may be stressful. I slept soundly sitting upright on this bus seat weaving and barreling in and out of Sri Lanka traffic. Sometimes when the bus would lurch Justin said I’d jolt awake throwing my arms up over my face like we were going to crash- I had no remembrance of these moments and am thankful for it. We made it to our transfer, took another bus- this one filled with 50 school girls in their uniforms and giggling so cute at us. Then a tuk-tuk to the airport- I emptied the sand out of my shoes from when I fell asleep on the beach the night before. The airport went smoothly except for my hula hoops. I left America with 17 hula hoops and am returning with only my personal stash of 6 lol they are collapsed down and small enough to fit in the overhead and typically NEVER a problem for me- buuut in Sri Lanka this was totally a problem – they said it was a pipe- and could be used as a weapon. This military man snarled at me squinting his eyes causing a deep crease in his blue barret. One hand on his gun and one finger poking at my chest he insisted my hoops were not coming on this plane and that i could not board until they were discarded or checked. Customs is a long way away by this point and I have maybe 30 minutes before my flight. I was strong face to face with this evil man but once I turned away and started thinking about how my lil hoops- not wrapped or padded- only tied together with my lil stretchy lace string were ever going to make it with thousands of pounds of luggage being tossed on them – I started to cry. I travel all over the world and always take my hoops as my carry-on- if for some reason they don’t fit I gate check them and they are gently hand carried. I was pissed, annoyed, and scared that my hoops would never be seen again. I started sniffling my way back downstairs to see what I could do when an airport representative approached me, explained that this man is notorious for being evil and apologized for his attitude. I explained that I was scared my hoops were going to be destroyed going through checked baggage and they reassured me they would be okay, they even ran ahead through customs so that I wouldn’t have to get back in line after and did all the paperwork and tagging for me and brought me back upstairs so I didn’t have to wait again in the security line either. They were actually really nice and my hoops did arrive unharmed. Thank Goodness!!! I was amazed and oh so thankful. Next stop Bangkok! We got a cheap room went to Mr. Yim’s – who makes my favorite green curry in all of Thailand. 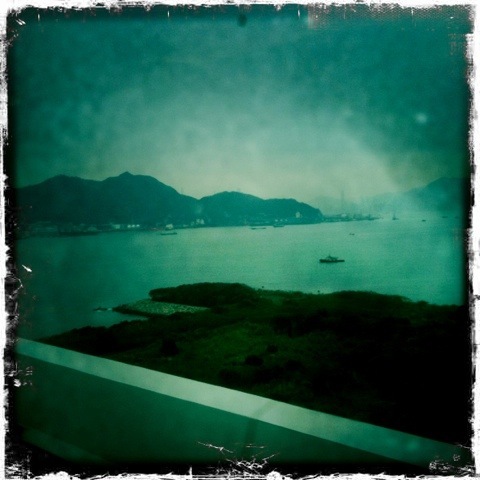 Ran around the night markets and then at 5am went back to the airport and flew to Hong Kong. Now….we were to have a ten hour layover in Hong Kong on the way in- but our flights were changed- so now we have a 6 Hr layover on the way home and we absolutely planned to make the most of it. Our good friend sent us some pointers and I left my carry-on bag at the cloak room in the airport. 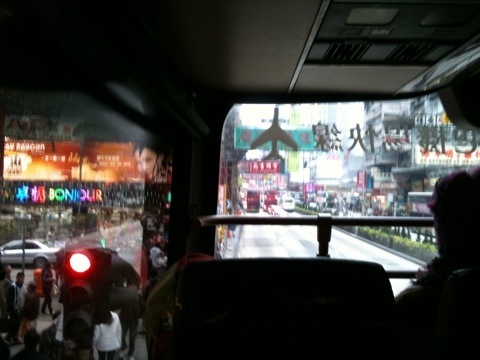 Justin and I hopped on a double decker bus and jaunted into Hong Kong. What a beautiful ride!!! 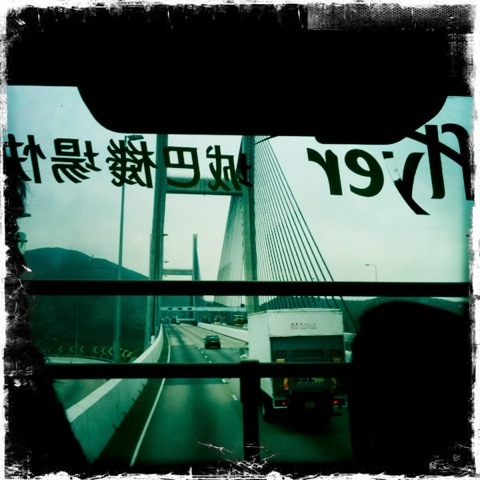 The China Sea, huge bridges, mountains, high-rises, gondolas, wow. This small excursion was super worth it. We emerged into the city that was every Chinatown times 1000 and paid homage to the OG. So cool. Wish we had more time but thankful for the glimpse. In the previous encounter- but metal doused in kerosine- no problem – hula hoops on the other hand . . . ) and our good friends scooped us up at the airport cushioning our landing hear in NYC. And tadaaaa we are HOME. Lolol. I love New York City so much, and like the moon to the tide, the longer I’m away the more it pulls me back- but the real truth is that I love my community here in NYC even more. Places will always be there to visit- even NYC won’t change too much while you are away- but the people that make it what it is are priceless and irreplaceable. This entry was posted in Uncategorized and tagged airport, baggage, bus, community, hong kong, hula hoops, love, NYC, plane, Sri Lanka by Ali Luminescent. Bookmark the permalink.